A floating dog dock allows dogs to climb out of the water onto either a boat, actual dock or even a poolside without getting injured or strained. These accessories also prevent you from getting injured (or falling in) while lifting a dog from the water. By using a floating dock your dog can enjoy the water on his own and make playtime even more fun. This ramp uses a mesh platform connected by floating tubes and a molded deck. The deck attaches to the side of the pool, boat or dock to stabilize the ramp while also giving your dog a spot in which to sit. The mesh platform slants into the water so that it seems to your dog as though he is climbing onto a sloped bank. The floating ramp is portable, light and holds dogs up to 200 lbs. So if you are looking for versatility, or perhaps have dogs of different sizes, this is the dock accessory for you. This type of portable dock also works on a poolside, boat or actual dock by hooking onto them temporarily. You can also make it a permanent dock by installing it onto the side of the pool, boat or dock you intend to use it on. The ramp can safely be installed on concrete, wood and fiberglass. Unlike the inflatable ramp, this dock is made of a special mildew and fade-resistant carpet on a Styrofoam flotation device. It safely holds dogs up to 90 lbs. This floating water accessory is not quite as versatile as the others listed here, but if you do a lot of boating with your dog it could make your life much easier. The ladder is lightweight and collapsible, making it easy to carry and store. It attaches securely to the side of your boat to provide your dog an easier way onto and off of your boat. The steps themselves are slip resistant to keep your dog safe and make him feel secure. It can be used for small to large breed dogs, and is even UV resistant so that it won't discolor in the sun after years of frequent use. 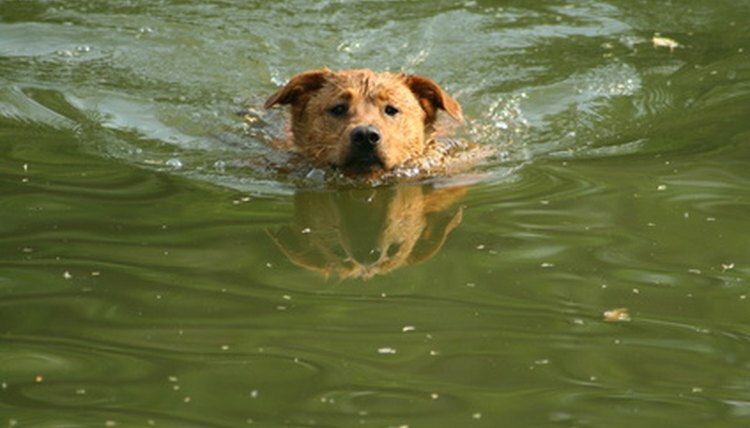 If your dog spends a lot of time around the water, consider getting him a life jacket of his own. These jackets come in different sizes for different sizes of dogs, and you can even choose a color suitable for your pet. The jacket is made of mesh material and fastens around your dog's neck and stomach using Velcro straps. This isn't a necessary item, but it makes a nice complementary item to go with your floating dock. Plus it keeps your best pal a bit safer in the water. How Does an Aquarium Float Switch Work?